A meeting for the tennis coaches will be held Wednesday evening, April 17, at 7:00 p.m. at the Tx State Tennis Complex Classroom. Girls Bracket positions will be determined at 7:00 p.m. and Boys bracket positions at 8:00 p.m. Bracket sheets will be available at this meeting. Note: Times are approximate. Courts will be assigned as available. All regional qualifier’s entry statements should be emailed by April 12 using the Entry form found on the UIL website to the Regional Tennis Director , email: mh86@txstate.edu. Each entry must bring one (1) can of unopened, yellow, USTA-approved tennis balls. Contestants should wear tennis shoes only – no jogging shoes will be allowed. Tennis competition will be governed by UIL and USTA rules. Officials from the Austin Tennis Umpires Association will officiate the tournament. A two-person team will serve as roving officials and will be available to resolve disputes. TENNIS PRACTICE must be arranged by the schools participating. Contestants should bring sun visors or caps for use during each morning or late afternoon matches. The TxState Tennis Complex covered courts may be used, if there is a need. You MUST purchase a parking permit!!! Please place parking permit on the dashboard of your vehicle. By visiting: https://parkingservices.txstate.edu/pnw2/selectValue.aspx. If this link does not initially work, please copy and paste it into your browser. “Select UIL Tennis Tournament” and follow the instructions. Please ONLY choose the first day you will be in attendance and click “Add to Basket.” The permit will be good for the duration of the tournament. Follow the payment instructions, print your permit and display it on the dashboard. 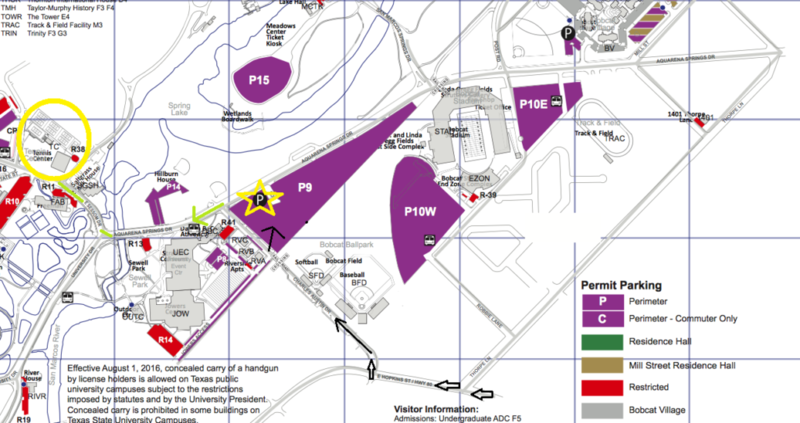 When you arrive, please park in the P9 lot, as that is what Texas State has allowed. You will then walk to the tennis complex, as marked by green marks and a yellow circle. If you choose not to purchase a permit online, you may purchase one for $5/day at the ticket kiosk marked with a P (star) on the map in Lot P9. Please park in the P9 lot, as that is what Texas State has allowed. You will then walk to the tennis complex, as marked by green marks and a yellow circle. ***Please recognize these permits are acceptable for buses and spectator vehicles. In the past, you may have traveled down Aquarena Springs Drive after exiting I-35. Please DO NOT travel using that route, as there is A LOT of construction on that road and periodic road closures. From parking lot P9, please follow the green marks and walk left down Aquarena Springs Drive, use the crosswalks turn right to walk up Sessom Drive, past Saltgrass, and the tennis complex will be on the right (circled in yellow). Copyright 2018, Region IV AAA. All rights reserved.